Honda Odyssey can handle 4 car seats. Hi David, The Odyssey really is fuel efficient. Or, consider a Honda Element and pocket a ton of extra cash. I bought a Volvo S40 and kinda regret it. I have to have the brakes repaired constantly and the eats gas. Fun and fast though! I also like the entire line of Mazdas. The 6 wagon is very roomy. Hey David, We bought the Volvo XC90 last year (after tons of research) and really like it. The third-row seat (which folds neatly into the floor) comes in handy when you have extra guests or kids to haul around. We love our Highlander — roomy, smooth to drive. It’s not a hybrid, but we wish it was! Careful of the Volvo– many horror stories. Consider the Audi A6 Avant wagon? Very fun–checks all the boxes but pricey. http://tinyurl.com/45r2t2. We have a 2005 Pilot. Lots of room. Very reliable. They are doing some very cool efficiency stuff with it this year that make it way greener. from MotorTrend: “Besides meeting more stringent ULEV-II emissions standards, the latest tri-mode version of Honda’s Variable Cylinder Management system permits it to operate on three, four, or all six cylinders, depending on load.” http://tinyurl.com/3h64dq Good luck! Dave, My sister has the Sienna and had three car seats no problem. We bought our RAV4 from Weitzes and he took good care of us (location wasn’t convenient though so we service downtown). My brother in law had a Mazda 5 that fit 3 car seats. Hey, they now make an Escalade Hybrid…can’t beat that for cool. Dave – as a former Honda Odyssey owner I can tell you that you’d be hard pressed to find a better built van. Honda CR-V 2 wheel or 4 wheel drive, costs the same as a Passat wagon, but has more room inside, is five star crash safety front and side. 100% in reliability, fuel efficiency, urban/suburban coolness, and user pleasing and drives like a car. A van is best for hauling kids and their friends. 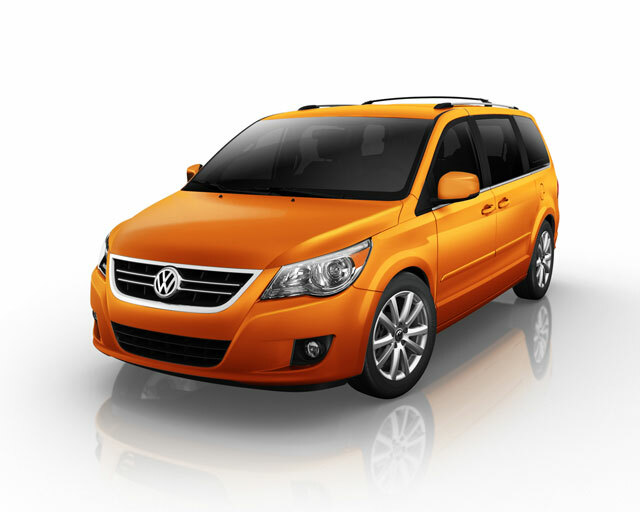 Routan is a Chrysler in VW clothing (litteraly). Try a Toyota Sienna or Honda Odesey. Very cool really, and not your Mom’s minivan for sure. I’ll be wanting a Passat Wagon over a CR-V for my little dogs, short wife, and two teenagers. Easier access than the CR-V, and I don’t need to lean in for car seats and so on. 4 wheel drive is expensive though.